Silly me. I thought the hardest thing about writing a blog while working a full-time job would be finding the time to post, but I was wrong. My biggest issue over the past couple weeks has been somewhat different its the light, or lack thereof. Barely mid-September and London has already decided to provide me with dark and gloomy weather comes dinner time. Which, as any photo-snapping food blogger out there knows, makes it next to impossible to get a good photo. Luckily, I’ve gotten over it. These days, I’m looking to put avocado in anything and everything I can. First up- this Panzanella-like salad of chopped veg and dried bread chunks. I’ve called it “Tuscanesque” because of certain elements – the cannellini beans, bread chunks, cherry tomatoes and basil – have a certain Tuscan authenticity to them. However, I’m not sure how many Italian Nonnas put avocado and red pepper in their salads, hence the -esque. But really, I don’t think authenticity matters one whit when food tastes (and looks, in the light of day) this good! If your bread is fresh, spread the cubes out on a baking sheet and allow them to toast lightly in the oven on a low temperature. If it’s already somewhat stale, simply tear it up and add to a large bowl. 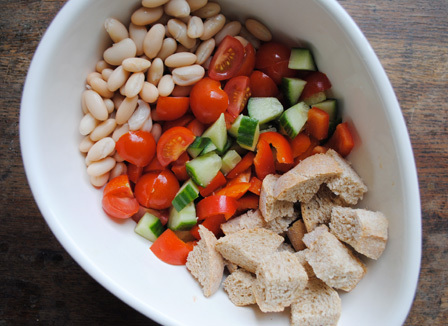 Add the drained beans, chopped tomatoes, cucumber, and red pepper to the bowl as well. In a smaller bowl, mix together the chopped avocado with the onion, vinegar and olive oil and toss well. This is to ensure the avocado gets coated with the acid in the vinegar, and won’t turn brown. Add a pinch of salt to the dressing, to taste. Just before you’re ready to serve the salad, pour the dressing and avocado mixture over the chopped bread and veg and toss together well. Sprinkle over the basil leaves and add a bit more olive oil, if necessary. Ah, the dark evenings problem! It’s a real problem, isn’t it? But this salad looks great. I love avocado and think it makes vegetarian food wonderful – it’s very different from most plants! Heaven on a plate pretty much. I’m shocked with your avocado confession. I couldn’t live without those little green guys. But when they aren’t good they REALLY aren’t good so maybe you just hadn’t had good ones? Whatever. I’ll forgive you. I’m starting to get alarmed about the (lack of) light too. I have one of those Ego lights that help and allow me to take photos in the dark of winter, but they just don’t look the same. I’m not a big fan of avocados, i like guacamole, but i don’t like the slimy texture in something like a crunchy salad. But it’s no biggie if it gets served up to me. Unlike my brother in law, who is allergic to it! The blandest, most un-flavoured fruit, and he throws up after eating it! Crazy. Avacados make my life. I can’t remember your stance on guacamole…? Ah, yes, the joys and sundown at 4 pm are heading our way… I’ve recently heard rumors some thing called a “light box” that is easily constructed to help remedy the problem, but haven’t dug out the motivation. In the meantime, the USDA has many open source passable if not amazing images of different ingredients, should you become desperate. P.S. To add to the avocado conversation, I absolutely agree they are just a bit too weird and feel very little compunction to overcome that emotion. I’m shocked with your avocado confession. I couldn’t live without those little green guys.